Login: Email Address: Password: Forgot Password? Interactive analytics for all 351 D-I basketball teams. Analytics for basketball coaches, not mathematicians. Hoop Lens was designed with coaches in mind. Modern analytics can seem like an alphabet soup of numbers disconnected from reality. But buried in these numbers are tools that can be used for self-assessment and scouting opponents. You know these numbers are out there -- you just are not sure how to use them. We can help. Waterfall Charts: a tool to instantly assess your team. 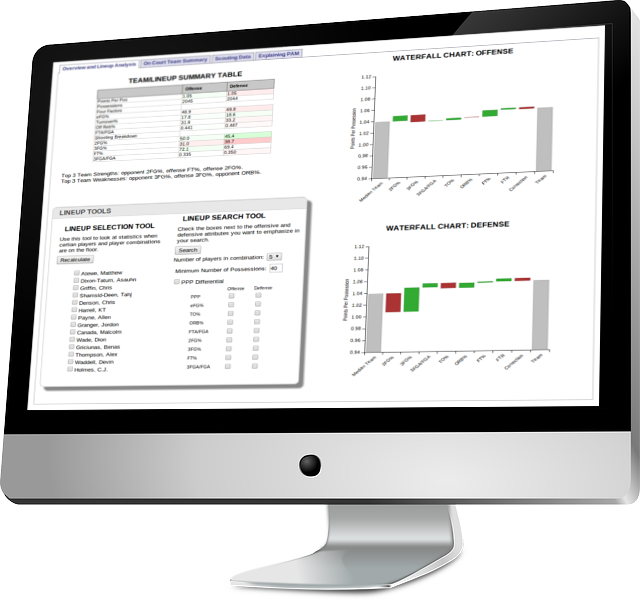 With waterfall charts, you can instantly identify your team's most important strengths and weaknesses, as well as those of your opponent. Waterfall charts break down your offensive and defensive efficiencies into 14 separate statistical categories (seven on offense and seven on defense) and show you how your performance in each category helps or hurts your team. These charts also prioritize these categories, showing you which numbers have the biggest effect on your team. You can learn to read waterfall charts in two minutes. Scouting opponents with Hoop Lens: focus on what is most important. Statistics provide powerful insights into what an opponent does best, and what is most important. Numbers can tell you what players are the most efficient scorers, and what makes each player dangerous. Our scouting interface helps you quickly determine all of this, by presenting the stats in interactive color-coded tables. But you don't have to spend your time puzzling over data tables, as Hoop Lens also provides automatically generated written explanations of what the stats mean for each and every player. Lineup derived statistics: find out what is working, and what is not. With lineup derived stats, you can see how your team does when certain players or player combinations are in the game. Our best in class interface makes exploring these seemingly complicated data a breeze. Just select one or more players from your team, click on a button, and watch the numbers and graphs update. Want to know which pair of players were on the floor when your defensive rebounding percentage was at its best, or which trio played when you best held down opposing offenses? These are the sorts of questions that the lineup search feature was designed to answer. Just select one or more statistical categories to search on, select the number of players in the grouping you want to find, and click a button. No stat, no matter how good, will ever replace breaking down film. But the right stats, used correctly, are a powerful complement to watching the tape. When studying your own team, our numbers help you correctly assess what your problem areas are. Then you can find them on film, and figure out what to correct. When studying opponents, our scouting module helps you quickly identify the most dangerous and efficient parts of your opponent's attack.